Programme for Annual Speech Day, Friday 18 November 2005. 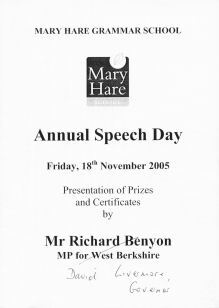 Note: This year the scheduled Guest of Honour Richard Benyon could not attend, due to the birth of a new child. David Livermore, a Governor of the school attended in his place. The Chairman will invite the Guest of Honour David Livermore to present the prizes and address the meeting. Ryan Marshall, the Head Boy, will propose a vote of thanks to the Guest of Honour. Philippa Merrick, the Head Girl, will propose a vote of thanks to the Chairman and the Governors.